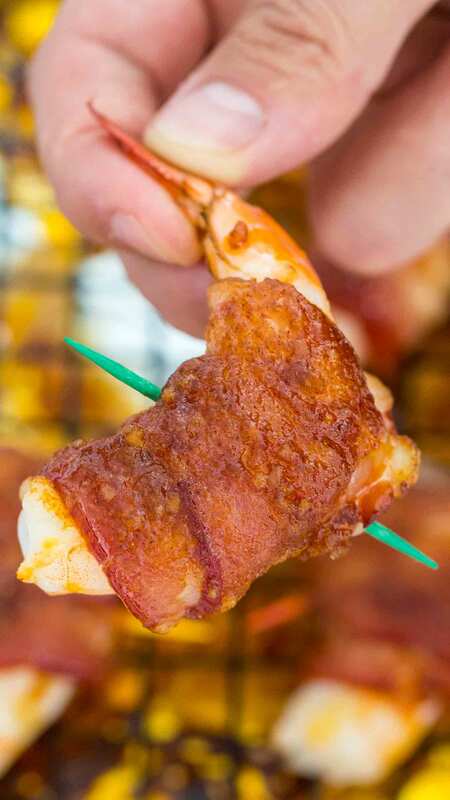 Bacon Wrapped Shrimp is the perfect finger food. A great combo of sweet and savory, thanks to the delicious smoky brown sugar rub that and crispy bacon. 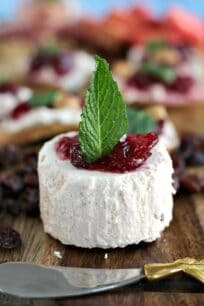 We love easy and delicious appetizers that can feed a crowd. Our other favorites are easy crab cakes, spinach artichoke dip, and cheesy turkey sliders. We eat a lot of shrimp in our family, we are huge fans. My husband is an expert at cooking shrimp, he usually makes it in the most amazing garlic sauce, that is so tasty when you dip in some crusty, warm bread. I recently made these Bacon Wrapped Shrimp and they were a huge success, so much, that my husband took a break from his beloved garlic shrimp. 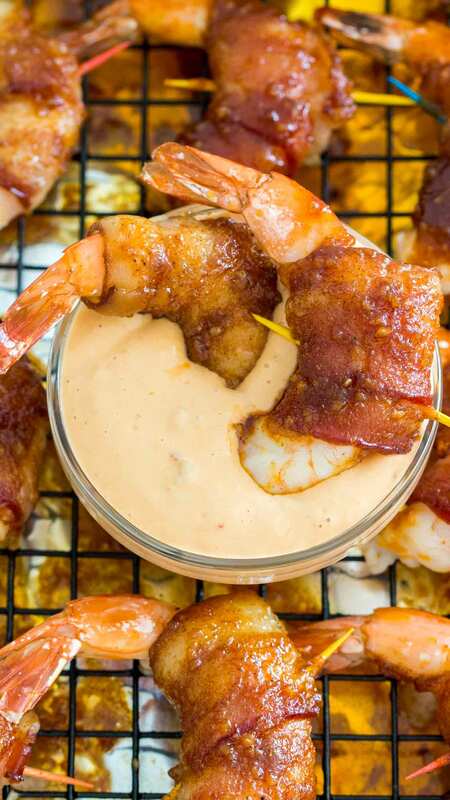 If you are looking for the perfect finger food and you love seafood and bacon, look no further, this recipe is the bomb. 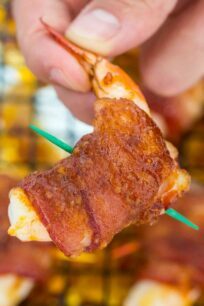 The shrimp is wrapped in thick bacon slices, coated in the most amazing brown sugar glaze and broiled to crispy perfection. Serve these with your favorite dipping sauce, and make sure you make a double batch. 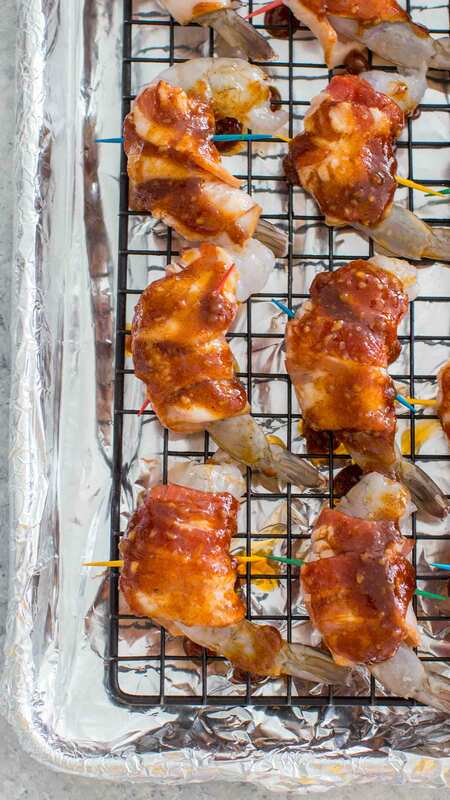 What do you need to make Bacon Wrapped Shrimp? Shrimp – I like to use wild-caught shrimp. 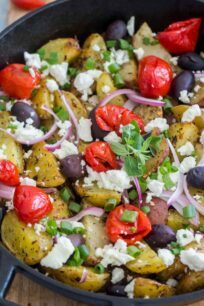 Onion Powder – you can skip it if you don’t have this ingredient, but I like the subtle flavor it adds. Smoked Paprika and Cajun Seasoning – for extra flavor, you can also use Old Bay seasoning instead of the Cajun Seasoning. How long do you cook Bacon Wrapped Shrimp in the oven? You have to bake the shrimp in a 450F preheated oven, for 15 to 20 minutes or until bacon is crisp around the edges and shrimp turn pink. How long do you grill Bacon Wrapped Shrimp? Lightly oil grill grate, arrange shrimp on the grill and cook for 3 to 4 minutes, turning once. The shrimp will be done when the bacon is fully cooked. How do you make the Brown Sugar Rub? 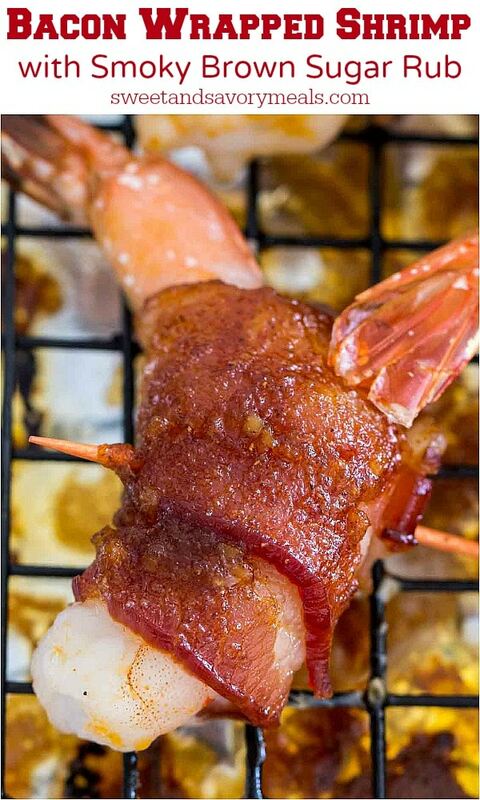 The Brown Sugar Rub is what takes these Bacon Wrapped Shrimp to the next level. The combination of the crispy bacon infused with the smoky brown sugar coating gives the shrimp a caramelized layer, that is too good to resist. The saltiness from the bacon compliments the sweetness from the brown sugar. The tender and juicy shrimp is the perfect vessel that makes these flavors work in harmony. To make the rub you just have to mix: onion powder, Cajun seasoning, smoked paprika, salt, minced garlic, and oil. The mixture will be thick, so you will have to spoon it over the shrimp. Also, an important note, the oil may tend to separate, so make sure you stir the mixture frequently. How to peel and devein shrimp? To peel raw shrimp, start underneath, where their legs are attached. Use a paring knife to devein by making a shallow slit down the middle of the back to expose the black strip intestine. Gently remove the black strip of intestines and wipe it off on a paper towel. To remove the tails just squeeze the shrimp out from the bottom of the tail segment. Wrap shrimp with 1/2 slice of bacon, securing with a toothpick. Line a baking sheet with aluminum foil (this will make cleaning easier), and place a baking rack onto it. Make sure you use a baking sheet that has at least 1/2 inch tall sides, otherwise the bacon grease will leak. Place the bacon wrapped shrimp on the rack. In a medium bowl, combine all the Brown Sugar Rub ingredients and stir well until fully combined. 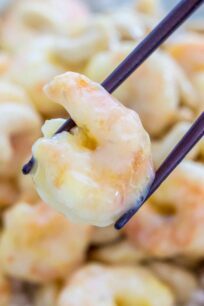 Spoon the brown sugar mixture onto each shrimp, about 1 teaspoon per shrimp, and using the back of the spoon, gently spread the mixture over the surface of the shrimp. I usually coat only the top of the shrimp. Bake in the preheated oven until bacon is crisp and shrimp are tender, about 10 to 15 minutes. The baking time has been determined by cooking large shrimp, if you are using small or medium shrimp, they will cook faster, while the bacon won't be as crispy. In that case, you can slightly pre-cook the bacon, to avoid over cooking the shrimp, or for best results just use large shrimp. My little cousin would absolutely LOVE these! This looks incredibly delicious! I have to put this on my menu! These look fantastic! I can’t wait to make these this weekend. Great football food. Such a great idea! Anything with bacon sounds good to me!